Acadian Genealogy Homepage; Acadian Triumph! It was 1604 when the first settlers from France arrived in the region of the Maritimes known as Acadia, which then included parts of current-day Nova Scotia and New Brunswick as well as Prince Edward Island, and was initially governed by France. By 1713, when the British took over, there were about 2,000 Acadians in the region. Most lived in what is now Nova Scotia at the mouth of the La Have River on the south shore and in the communities of Port-Royal on the Annapolis Basin, Grand Pre on Minas Basin, and Beaubassin (now Amherst), near today's New Brunswick border. 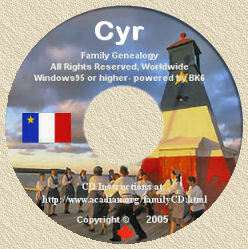 Just about everyone in an Acadian village was related in one way or another and had kin in other settlements as well. Blood ties created a network of support, the more fortunate rescuing the victims of natural disaster or warfare. No one recognized Acadia as a nation, yet it had a kind of national solidarity and its system of family organization helped it cling to a countryside that great powers coveted for more than a century. The Acadians had cattle, sheep, hogs, fish, grain, vegetables, orchards, maple sugar and plenty of firewood. Hunting provided meat and hides for both clothing and trade. Defying the orders of France, Acadians happily traded their pelts and grain for Boston's clothes, tools, dishes and rum. By the time the British took over, they had come to love their land more than they loved France...or hated England. In 1755, when mainland Nova Scotia had been under British rule for 42 years, about 13,000 Acadians lived there. With war between Britain and France breaking out, they were seen as a potentially overwhelming threat by the colony's lieutenant-governor, Colonel Charles Lawrence. Repeatedly they had been asked to swear an oath of allegiance to Britain. But since the Acadians had no desire to fight anyone, especially French-speaking Catholics like themselves or France's Micmac Indian allies, they stubbornly refused to take the oath, which would oblige them to bear arms for the king of England. Eventually, wrote the historian Donald Creighton, the lieutenant-governor "collected the astounded and bewildered people and shipped them off to the other English possessions," including Massachusetts, the Carolinas and Delaware. Many were also sent to England and France. By 1763, the British had deported 10,000 French-speaking men, women and children--- many of whose families had been in the region for more than a century. Hundreds of others fled into the forests, where some lived in hiding for years, while others either starved to death or were captured by the Redcoats. Many of those deported lost their lives in shipwrecks or died of smallpox and other infectious diseases, which spread rapidly in the filthy, overcrowded vessels. The survivors often endured virulent anti-Catholicism in the British colonies to which they were sent. Miserable and stateless, some south more congenial locales and found their way to the West Indies, South America and even the Falkland Islands, where there were French settlements. Some resettled in France but yearned for the freedom of North America and eventually joined exiled relatives who'd established themselves in Louisiana. After the end of the Seven Years War between Britain and France, Acadians began to trickle back to the Maritimes. The fine farms they had once owned however, had been taken over by British subjects (mostly New Englanders), leaving the Acadians no choice but to settle on inferior land, much of it coastal. But at least they were back in the part of the world they loved best. Acadians still call the expulsion "le grand derangement" (the great disturbance). The brutality of the deportation, the broken families and lost lovers, the horror and heartbreak of it all--- these became the central epic of the Acadian people. Part of the story, too, was the unsinkable spirit of the survivors, wherever they happened to end up. In the late 1800's and early 1900's, a wave of Acadian nationalism swept across the Maritimes. Acadians began to get together at places like Memramcook, N.B., Miscouche, P.E.I., and Church Point and Arichat in Nova Scotia. Out of these gatherings came a national anthem, "Ave Maris Stella" ; a national day, the Feast of the Assumption on August 15; and a flag, which features a gold star against the French blue-white-red tricolour. The above note is a re-print, in part...and with thanks, of the article written by Harry Bruce, entitled "Acadian Triumph". The article was written for the Winter 1998 issue of "Imperial Oil Review".